Mozart's Prussian Quartets are not as Prussian as the title suggests. Despite assumptions about an explicit commission from the Prussian King Friedrich Wilhelm II, there is no evidence of this. The quartets were not even composed in Prussia. 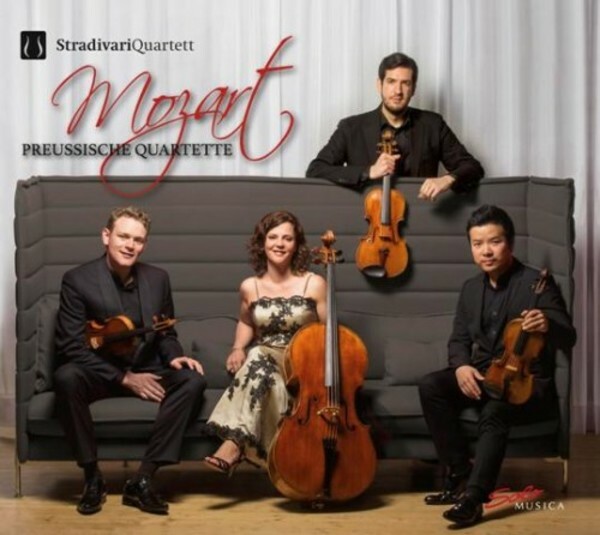 The Prussian Quartets are the last set of string quartets Mozart composed before his premature death. Although the set was planned to comprise six quartets, only three were published: K575 in D major, K589 in B flat major and K590 in F major. They were written in 1789 and 1790. Since its debut in the Zurich Tonhalle in September 2007, the Stradivari Quartet has made a name for itself as an ensemble of great promise and become one of the leading Swiss string quartets. Some thirty performances a year take the Stradivari Quartet to venues all over the world. The Stradivari Quartet is among the few ensembles in the world performing exclusively on instruments of the famous violin maker Antonio Stradivari. Each of the four instruments has its own history and some have travelled far and wide. They are today all in the possession of the Habisreutinger Foundation and are on loan to the Stradivari Quartet.